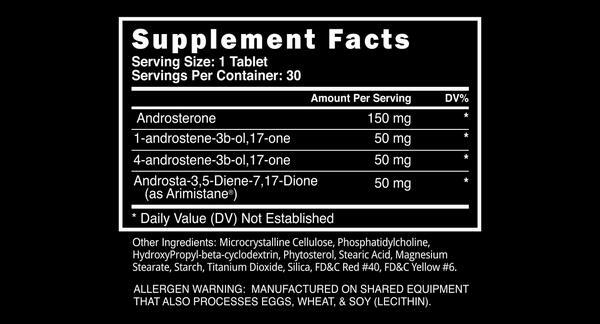 This is a great little all in one stack that puts the user through a very reasonable cycle on the body while still achieving some serious results. So often I find that a compound on its own is simply not an effective solution, for example 1-Andro, an amazing compound for its anti estrogenic effects and potential gains but unless you stack it with something a little “wet” like 4-Andro your gains will be minimal and the lethargy will be intense. Here we have that exact combination WITH some Androsterone for energy and libido AND a solid dose of Arimistine as your AI. This means you really don’t need to run anything else aside from a liver support and some PCT. Its a once a day pill which for me is plenty since I am of the opinion less is almost always more for so many reasons. If you’re a first time user of products like this I can’t think of a better place to start then this formula right here, its packaged up and ready to go as is so you don’t need to workout your own complicated stack. None of the components are particularly harsh but do run your liver support and do have some extra arimistaine or PCT formula with arimistaine in it for after your cycle is finished. (SERM optional but I’d always run at least a light dose of Nolva just in case). Introducing the most potent designer prohormone ever released on the open market. Metha-Quad Extreme is the dream stack that has become a reality. Rapid increases in size and strength. Dry gains that leave no unwanted water retention. Density to the muscle resulting in a mature look to the physique. And pumps that are typical for the off season, but with vascularity that will be mistaken for a contest prep bodybuilder. 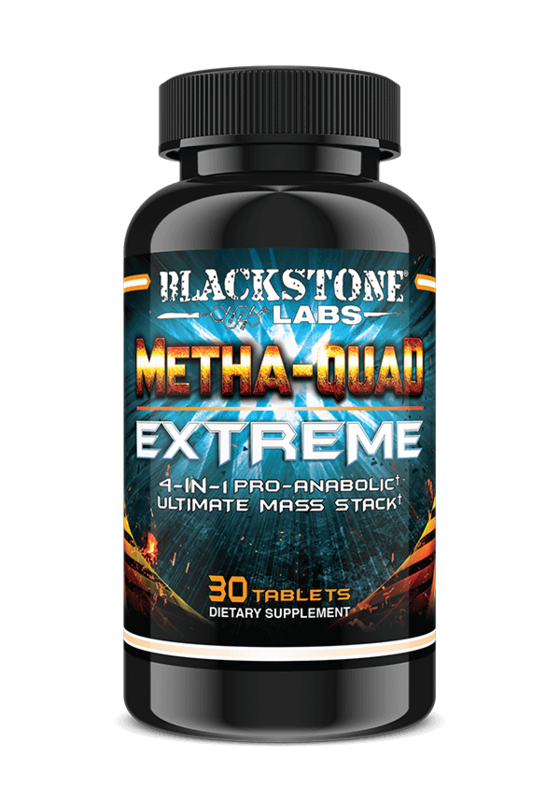 Metha-Quad Extreme is the product you have been waiting for from Blackstone Labs, you just didn’t know it was possible. Now it is and it’s all packed into 1 Liposomal Tablet. Alone, the four compounds in Metha-Quad Extreme are enough to produce great gains for the inexperienced and even advanced user. Stacking two or even three of these ingredients together will take your physique to a level that you haven’t seen yet, but when the four are combined a powerful phenomenon happens. The synergistic capabilities are unmatched putting your body into hyper drive giving your body no other option but to grow, get stronger, and leave everyone in the dust. What makes this product even more exciting is that the results you’ll experience are compatible with whatever phase you are in with your training and diet. If you’re deep into your off season growth stage, then Metha-Quad Extreme works perfectly as it provides all of the prohormones necessary for huge jumps on the scale, while allowing you to add more and more 45 pound plates to the bar. And if you’re in contest mode or cutting body fat, you won’t have to worry about losing muscle or strength while doing so. The dry properties of Metha-Quad Extreme won’t leave you blurry or weak. Diet freely knowing that not only will your hard earned muscle be preserved, but you will likely even gain more muscle while being in a caloric deficit. The cheapest price in Australia I have found so far!